Turn off the alarm and get your rear in gear! From the time I was in junior high school I have always been one to wake up to the sound of my alarm clock, turn it off, and get my tail out of bed and begin my day. Not that I’m never tired, or haven’t been up all night, not being afforded an ounce of sleep – it just doesn’t matter. I hear that alarm and it’s like something in me wants to stand up, salute my day, and say the pledge of allegiance. In fact, I can almost hear the National Anthem in my head. I have never been able to understand those that are not like this. You know the kind. 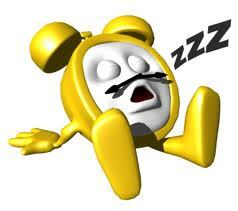 In fact, you may be one of them, those that hit that snooze button anywhere from 3 – 7 times EVERY day. It drives me absolutely bonkers! And by the way, these same folks constantly refer to ME as a procrastinator. Say what? Why can’t these people use some major discipline, hit that button, get their butts outta that bed and be on their way? The thing I always want clarified is how is five more minutes going to really give you that sleep that you need to make it through the day? I suppose when five minutes turns into 60 minutes, it adds up, But how much rest are you actually getting? Use some self-discipline people! Don’t make others responsible for being your five-minute wake up call. Wondering if these same people, use this same tactic throughout their lives and business. Are these the employees that keep making excuses for not having their project done on time and the deadline has to be extended? Are these the same students that make excuses for not having their homework done on time? Here’s reasons why you SHOULD’NT hit the snooze button. Is this a pattern or simply an annoying habit I will have to deal with the rest of my life? What do you think and which one are you? This entry was posted in Uncategorized and tagged caregiving, early to bed early to rise, get your rear in gear, getting up in the morning, hitting the snooze button, just stuff, procrastinators, susan avello, take too long to get up, the working caregiver, why do people hit the snooze button. Bookmark the permalink.